Why Do I Have to Work in the Concession? A mystery bag after every game…because it’s a tradition! The Myrtle Park concession stand is a huge part of the Little League experience. 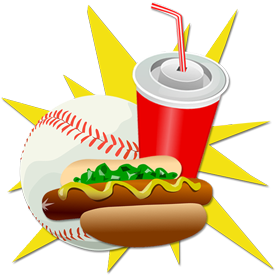 For many of our younger players the post-game trip to the concession stand is the highlight of their baseball game. The stand adds an atmosphere to the park that means players stay after their game, hang out with friends, play in the playground and watch the next game. The MSLL baseball experience simply wouldn’t be the same without it. Behind the scenes the concession stand takes a HUGE amount of work – all of which is done by volunteers. The product volume is not quite enough to justify wholesale ordering, so all purchasing is done by the Concession Manager Kim – with weekly trips to Costco as well as several other “top-up” shopping trips when items run out. Just imagine the amount of pop, candy and hot dogs that need to be purchased, transported to Myrtle and loaded into the concession. Kim puts in several hours on Sundays restocking the concession after each busy Saturday. Then there’s the mystery bags. Last year we sold over 5000 mystery bags – and we are currently on pace this season to far exceed that number. Every bag has to be opened, filled and closed by hand and it’s all done by a small group of volunteers. There is also the work of scheduling the teams in the concession – a logistics problem tackled this year by Dawn. Fitting in each team for an equal number of shifts that correspond with their game times is quite the brain teaser. Dawn also takes on the job of recruiting and training teenagers to work in the concession when teams are unable to find volunteers and choose instead to buy out their shift. The concession is open 5 days a week – and a small group of ladies take responsibility for opening and closing each day. These ladies are there to provide training to the team volunteers and help get the shift started, and to cash out and help close up at the end of the night. We are often asked why we don’t just hire teens to staff the concession instead of requiring teams to work volunteer shifts. There are 2 good reasons for this. Firstly, it’s actually not that easy to find teenagers to work in the concession. The teens in this neighbourhood are a busy group with their own sports, homework/exams and other activities. Older teenagers are likely to have regular part-time jobs that take priority over an occasional concession shift. Secondly, volunteering is an essential core part of the Little League experience. EVERY parent should expect to contribute some volunteer hours each season. Being asked to work a 1.5 hour volunteer shift in the concession should not be a problem when your child is participating in a league that runs entirely on the efforts of volunteers and is playing on a team that is coached and managed by volunteers. So if you are asked to work a concession shift – please step up to the plate. It’s easy, you will be shown what to do, it’s a great way to meet people, and our volunteers generally find it be to a lot of fun!